So, vacation #1 is over. We had planned to go camping in the Atlanta area, but rain derailed it, so we ended up changing plans the night prior to leaving. It was slightly stressful trying to find a new place to go and new accommodations and all that, but it was sort of fun being so spontaneous. 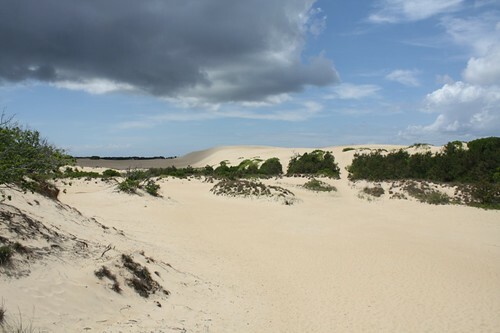 We ended up in Nags Head, NC (OBX), which appeared to be the only place NOT being rained on. 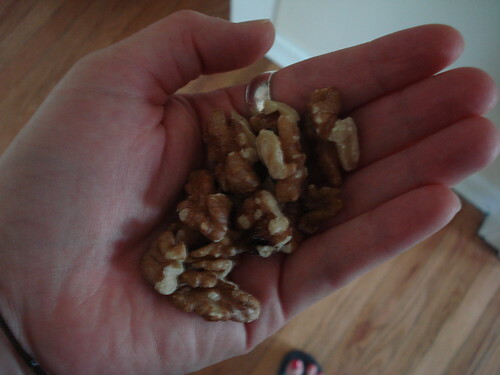 Lots of fun, but I unsurprisingly came home with 5 extra pounds and a stomachache. Today’s been good. 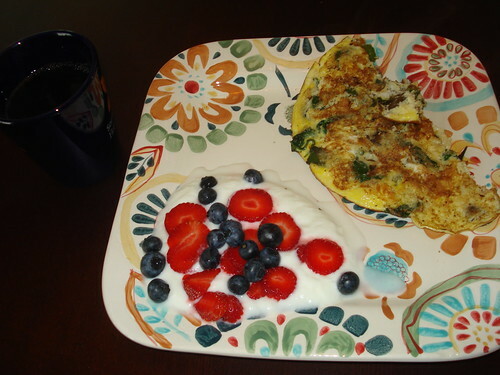 It started out with breakfast made by my sweet husband. We split a frittata made with a bunch of veggies: spinach, garlic scapes, bell pepper, mushrooms. We also had some plain yogurt with fruit. And black cofffee, of course. After breakfast, we headed to the nearby farmers market to stock up for the week. 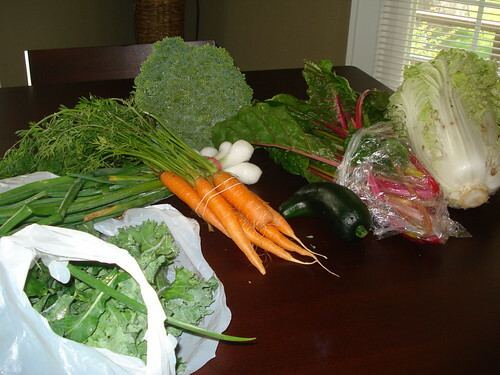 We picked up kale, onions, carrots, broccoli, zucchini, swiss chard, cabbage. We stopped to do some grocery shopping at Earth Fare to pick up the rest of the groceries for the week and ended up eating lunch while we were there. 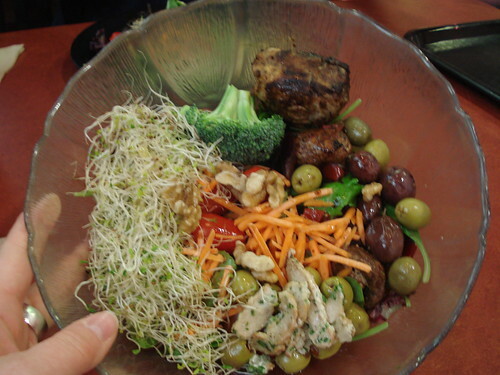 My salad had greens, sprouts, carrots, olives, broccoli, tomatoes, walnuts, mushrooms, some balsamic vinegar and olive oil, and a small piece of grilled swordfish. Oh – and a tiny portion of some sort of chicken concoction. We came home and put everything away, hung out for a little bit, had a snack and then went shopping for new running shoes (which almost killed me when we paid – so EXPENSIVE!). We did some yard stuff when we got back from shoe shopping – mowed, weeded, watered, etc. My sweet husband cooked dinner after we finished all of that. 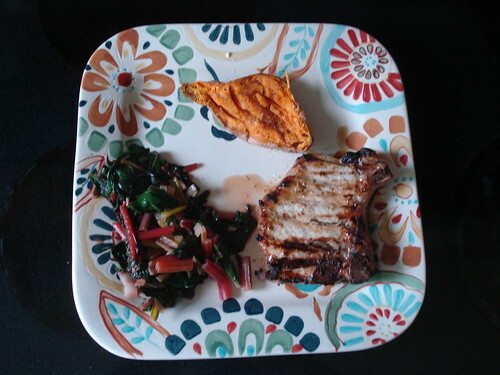 He grilled pork chops, we split a sweet potato, and he sauteed the swiss chard with onions. We’re watching a movie now and are kind of unwinding. 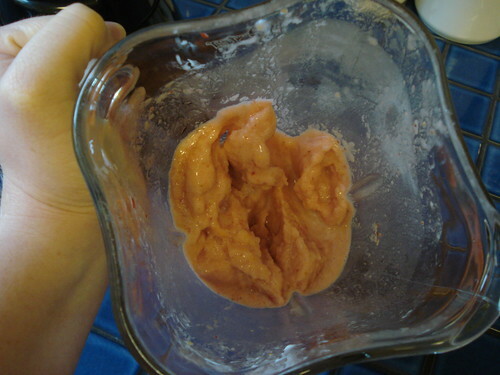 I was feeling a little hungry, so I just made a quick smoothie with some frozen strawberries and peaches, a couple T of plain yogurt and a tiny bit of honey. It was tart, but thick and close enough to being ice creamish that it satisfied my late night cravings. I feel so spoiled – fun vacation, fun weekend.